Happy New Year! I love starting a fresh year, and love it even more so because we get to kick it off here with some serious sparkle. In Japan, they bring together all available family members for a state reception filled with tiaras; in Denmark, they attend the New Year’s banquet, one of the most formal events of the year and an occasion to wear the golden chains of the Order of the Elephant and some of their best jewels. Click here for photos and here for a video. Like I always say, for sheer tiara quantity, you can’t beat a mass gathering of the women of the Japanese imperial family. Each woman has her own parure to wear, and though the use of strictly white jewels can start to appear monotonous (what a thing to say about diamonds, right?! ), there’s a style here for every taste. We've only featured two of the tiaras on display: the Akishino Tiara and Princess Kako's Tiara. 2012 was the last time we saw Empress Michiko wear a tiara to this event. She’s stopped wearing them altogether, probably because of problems with the added weight. I do miss the Imperial Chrysanthemum Tiara, but I also can’t argue with that wonderful large brooch pinned in stomacher fashion. The Empress doesn't lack in sparkle simply because she goes tiara-free, that's for sure. 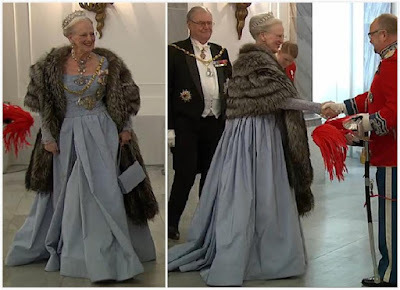 Queen Margrethe is a champion dress repeater, and I'm all for that when it means my favorite of her new gowns - the one worn to 2015’s Dutch state visit and to one of her birthday dinners - comes back. She paired the dress again with the Pearl Poire Tiara; her necklace, brooch, and earrings come from the pearl, diamond, and ruby set belonging to the Danish crown jewels. Prince Henrik made his first appearance since the surprising announcement that he would be retiring from most public duties in 2016. I wasn’t surprised that the Prince Consort made the decision – he’s 81, and seemed to have more trouble getting around lately – but I was surprised that Queen Margrethe decided to make a big official announcement as part of her traditional New Year’s Eve speech. (Since I know someone will ask, Queen Margrethe has said in the past that she will not consider abdication.) He'll still make the occasional public appearance, so he's not disappearing. 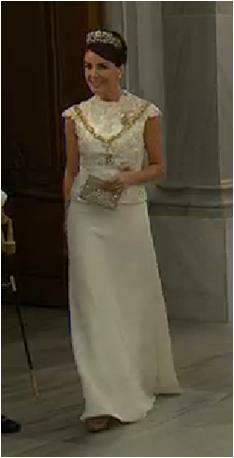 Princess Marie’s white skirt and top are new, but the shape and the combo of a detailed top and plain skirt give me flashbacks to her blue/gray peplum outfit from 2014. It’s a good look anyway, and I love her hair with her usual Diamond Floral Tiara. Mary is also a champion dress repeater, and you just knew she had something up her sleeve when she wore a separate top and skirt for her amazing BAMBI Award appearance in 2014. When she first emerged from the car this evening, I thought she had a blue version made of her beloved reconfigured red velvet gown, but no! There’s a creative reuse twist: the skirt from her sparkling navy blue Jesper Høvring ensemble has been recycled here with a new navy velvet top with a built-in train (the train on the original blue skirt was still there, underneath the velvet). The matching embellishment on the sleeves tied the pieces together, and the skirt was quite swoopy and spectacular in movement. ADORE. She paired it with the Danish Ruby Parure (tiara, earrings, and hairpins), which is what she wears every year for this event. Who are you declaring the best dressed of the night? For more: Click here for a video, and here for a gallery. P.S. : Next post will be a new tidbits edition on Monday!